Major plumbing repairs are never a fun undertaking, but it’s always better to proactively replace an important piece of equipment before it fails rather than having to deal with the aftermath of a serious plumbing issue. Your sump pump is probably a piece of equipment that you don’t pay much attention to, but when a sump pump fails it can spell disaster. Without a working sump pump, your basement will flood, creating water damage to anything stored in your basement and inviting mildew, mold, and other serious health hazards. In today’s blog, we teach you the warning signs to watch out for so you know when to replace your sump pump before it fails. Learn more, below. Is it time to replace your sump pump? Unusual noises. 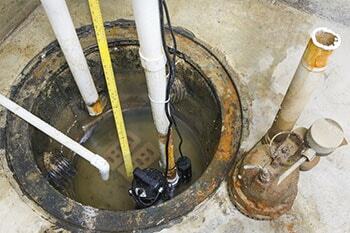 Your sump pump shouldn’t make much noise most of the time except for a faint, low hum. Be sure to get used to what your sump pump sounds like when it’s working normally by spending a little time in your basement the next time it rains and keeping an ear out for when it kicks in. It’ll usually make a distinctive but fairly quiet noise that you’ll be able to identify. If your sump pump starts to sound odd or increasingly loud, call your Maryland plumber for a thorough inspection. Water coming in. If you have water coming into your basement, you either have an unfortunate leak somewhere or your sump pump isn’t doing its job. Be sure to address water issues as quickly as possible because water damage is costly to repair and avoidance is the best remedy. Age. If possible, try to get an idea of your sump pump’s age from your home’s previous owner. They are generally designed to last 10-20 years and although you may not need to replace it as soon as it reaches its 10th birthday, you should probably start to keep a closer eye on it to ensure it’s working properly. This entry was posted on Thursday, March 3rd, 2016 at 9:49 pm. Both comments and pings are currently closed.